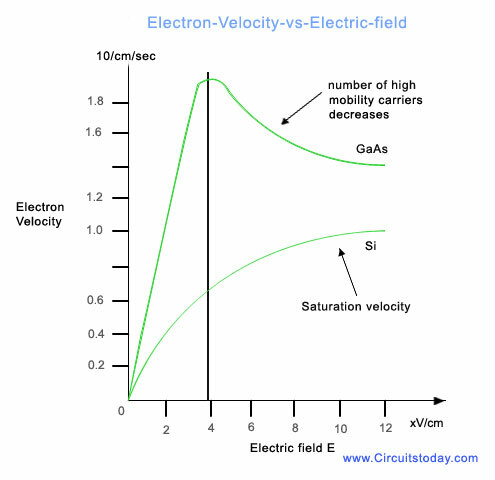 In this post, the graph between the electron field and the electron velocity is explained. The reason for the decrease in the drift velocity of the electrons have also been explained in detail. The charge carriers in the GaAs material that is the electrons will obtain energy as soon as an electric field [E] is applied. When the energy is obtained from the field, the electrons will also lose certain amount of energy due to collisions that occur due to optical photon scattering with the lattice. Thus, due to the gaining and losing of energy, the resultant balance will either be positive or negative. If it is positive, an increase in the applied field will cause a rapid increase in the energy and drift velocity of the charge carriers. Sometimes the resulting balance will be equal, that is the energy gained from the applied field will become equal to the energy lost due to collision. This will cause the drift velocity to reach a limiting value, known as the saturation velocity, Vsat. Gallium Arsenide (GaAs) is known to be a multi-valley semi-conductor.Â Thus when there is an increase in the energy level of the lower valley electrons, the electrons tend to attain a high temperature and become hot. The increase in energy level is normally referred to as electric fields which are greater than almost 3500V/cm. These high temperature electrons are known to have an upper conduction band in some regions of the electron velocity-field characteristics. This phenomenon occurs due to the high electron effective mass. Due to this problem, there will be a decrease in the drift velocity of the electrons. There will also be a decrease in the number of high mobility electrons. The region where the hot electrons occupy an upper conduction band, the drift velocity will no longer be proportional to the electric field. But instead, it will pass through a maximum of about 2*107 cm/sec with increasing field, and also decrease to an electric field independent saturation value of about 1.4*107 cm/sec. The velocity-field characteristics illustrating the three regions of interest are shown in the figure below. For convenience of comparison, characteristics for silicon are also illustrated. From the figure it can readily be noted that in low electric field regions, silicon has a much lower mobility than gallium arsenide. This increases monotonically until the drift velocity saturates at a value of about 1*107 cm/sec.